In Traffic Jams (playing at the Toronto Fringe Festival), Thalie — a songwriter struggling with an artistic block — has staked out a position at the middle of a traffic island, refusing to budge until she completes her indie album. As we get to know her, though, we learn that there’s a lot more going on here than a stalled creative process. The traffic island setting wasn’t chosen arbitrarily: the show draws upon its setting to emphasize a whole battery of liminal themes and situations. 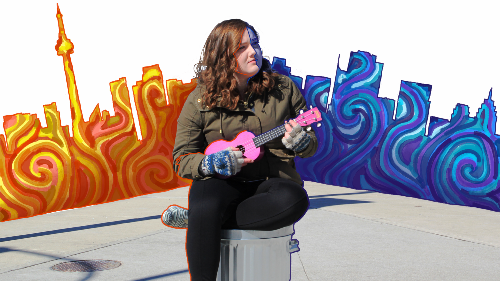 (Mental illness, homelessness, the creative process, transitioning to adulthood, insomnia…) As such, the project takes a much darker tone than many of us may expect: Thalie isn’t a Manic Pixie Dream Girl here to brighten our day with her quirky ukulele. Nor is she on a straightforward voyage of self-discovery. She’s stuck in the middle, on her island, dodging traffic and doing the best she can with the resources available to her. And, on that subject, performer Taryn Dougall (supported by co-director Alexandra Jones) does remarkable work as Thalie. This is a very dangerous show to choose, not merely because it’s challenging, but because it all depends upon the performer’s ability to connect with the audience: Thalie needs to sell this show, and all its conflicts and contradictions, trading in humour and hubris and hatred and hollowness, and Dougall consistently hits every single note. And speaking of notes, here’s a rarity: a Fringe play with music where the songs actually illustrate and suggest and advance the story, rather than just hinting or restating or cutting off scenes which the playwright couldn’t figure out how to end any other way. Whether they’re played for comedy or pathos, each one is a little nugget of necessity, totally inextricable from the whole — and the show’s better for it. I should warn you that, while there is nothing approaching real violence in the show, there are plot points dealing with suicidal ideation and self-harm, and these may be unwelcome surprises to some people. That aside, there will be others who just won’t get it: they’ll find it all too mopey and morose, or they’ll just be unable get into Thalie’s groove. I brought a companion who felt similarly — for the first ten minutes. But Dougall’s such a charismatic performer that she won us both over, and a lot of people who’ve never spared a thought for any of the issues Traffic Jams raises will leave the Tarragon with new questions and a new view of how these issues are connected. And for some of us, Traffic Jams will be nothing short of a revelation: liberating, affirming and challenging. Content Warnings: Mature Language; Suicidal Ideation; Self-Harm. Photograph of Taryn Dougall by Daniel Velez; Art by Alexandra Jones.